Aston Villa boss Steve Bruce has again responded to questions over the future of Jack Grealish, and insisted an agreement with Tottenham is not yet even close. The 22-year-old played a key role in Villa’s 3-1 win over Hull City on Monday night, as they started the new Championship campaign in perfect fashion to boost morale. Last season ended in heartbreak for the club after their defeat to Fulham in the playoff final, and so with another year in the second tier ahead, it has naturally raised question marks over one of their biggest stars. As reported by Sky Sports, although Bruce conceded it will be “difficult” to keep the creative ace at Villa Park this season amid interest from Tottenham, he understands that Spurs haven’t even come close to making a satisfactory offer to force the owners to consider accepting with Thursday’s deadline looming. “We will do our best to keep hold of him, but it is going to be difficult,” he is quoted as saying. “We understand the human side. He will want to play in the Premier League, Europe, Champions League. 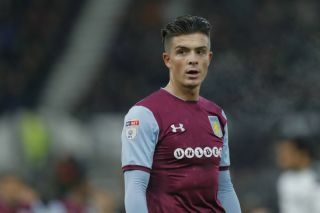 Although Grealish has come through the ranks at Villa and will undoubtedly be attached to his boyhood club, the temptation of potentially joining Spurs will also likely be great given the offer of battling for the top spots in the Premier League and playing in Europe. Coupled with the fact that Mauricio Pochettino has built a reputation of improving young, English players including the likes of Dele Alli and Harry Kane, it could be the perfect move for him to further his career. Nevertheless, as per Bruce’s comments above, it all still comes down to whether or not Tottenham are capable of making a bid which convinces Villa to accept and sell their prized asset.